That story may well be apocryphal but it does paradoxically represent an aspect of leadership, but only one aspect. And if this is the only aspect of leadership displayed by someone then that person is not truly a leader. Instead they are a mere panderer to popular sentiment, something to which the most craven of politicians are prone, as we know in this part of the world to our cost. I’d call what our French friend was at maintenance of legitimacy. This is something that all leaders have to do whether that is upward management to a superior or a board, or in the case of a political figure like this French chap, to a constituency. But there are two other components to leadership. First there is staff development and with that the attendance to the key management functions that drive an organisation. Then there is strategic choice. Strategy is one of those terms, a bit like leadership, which a lot of people use but meaning sometimes quite wildly different things. 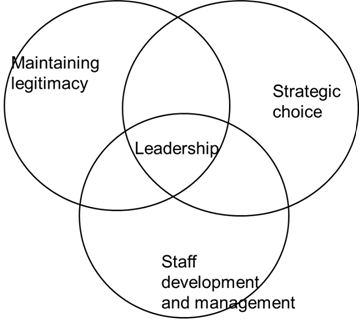 So just to be clear about what I mean by strategic choice it is about the allocation of resources to priorities in order to obtain immediate term survival or long-term success of an organisation. One of the other things I’ve noticed over the years is that it is immensely difficult to do all three well over a given period. I’m not quite sure if that is a matter of personal aptitude, lack of time, or difficulty of circumstances. When I was working in Angola at the end of the Civil War there I felt I did two of the three well. I made the right strategic choices to build the operation to provide humanitarian assistance to over a quarter of a million people and I helped mentor and train a cadre of staff who have become, in my opinion, outstanding leaders in their own right. But I was poor at upward management in large part because of distance from head office, changing personnel there and the simple stress of working in wartime. This meant that when I left many of the achievements, particularly in relation to learning and management, which we had made were insecure and many of them eroded quite quickly afterwards. I beat myself up a lot over that for some years but began to forgive myself a little when I read a biography of Hannibal a few years ago and found that he was pretty lousy at upward management too: a significant reason why Rome not Carthage won the Punic Wars was because Hannibal was so alienated from the Carthaginian Senate that they refused to reinforce him at a crucial moment and so his Italian campaign failed. In Western Europe Alexander, the Macedonian king who conquered so much of the known world, is usually known as “the Great”. But in Iran he is known to this day as “Alexander the Accursed” because there he is remembered for devastating one of the great flowerings of Persian civilisation. I told a Greek friend once about this dichotomy and she got very angry, shouting about how no one could say that, it wasn’t true: Alexander was the greatest of men. I said “But why are you getting angry? He wasn’t even Greek!” and our relationship never really recovered. 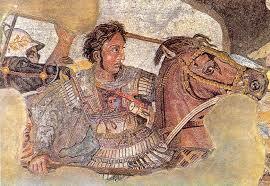 Now I tend to have more sympathy for the Iranian rather than the Greek, or Macedonian, view of Alexander. But my point here is that it is intrinsic to leadership to have enemies. This is obvious when you think about political or military figures from Alexander to Theresa May. But this polarisation of opinion is also inevitable in other leadership environments. This is because strategic choice – the allocation of resources to priorities – is such a fundamental aspect of leadership. In such choices there will always be winners and losers and this will bred resentment. Lincoln is today regarded as the greatest president in US history. But Shelby Foote, a historian of the American Civil War, told the story of how when he was writing his Magnus Opus, he contacted a descendent of the vile Nathan Bedford Forest, the most brilliant Confederate cavalry general of the Civil War, and subsequent founder of the Klu Klux Klan. Foote told her that he regarded Lincoln and Forest as the only two authentic geniuses to emerge from the war. “Well”, she replied, “my family never cared much for Mr Lincoln”. That sentiment was widespread in Lincoln’s lifetime. One gets a sense of this from the film Lincoln. He was vilified in Congress and by large swathes of the Northern press let alone the Southern. His treasury secretary, Salmon Chase, plotted what was in essence a coup d’état against him. Most of his cabinet colleagues thought they were much more qualified than him to be president. In her book Doris Kearns Goodwin makes a strong argument that Lincoln’s niceness was a fundamental factor in enabling him to lead and manage though the crisis of the Civil War. I think that is important to remember when all the tales of hard-nosed management are told and management ideals are presented to us on television who are clearly selfish, self-serving and obnoxious individuals. Lincoln was able to hold together his fractious cabinet in part because of his warmth, humour and generosity of spirit, something that still echoes down the ages. But I think there was something deeper too which was Lincoln was a person of immense moral courage. By this I mean he had that uncommon capacity to take personal responsibility for hard, sometimes terrifying, decisions, through the consideration of mature and selfless personal principles in interaction with the leadership challenge he found himself presented with. And he was open to the growth and evolution of his principles and values from experience. Just how uncommon that capacity is is starkly indicated by consideration of one of the most shameful episodes of human history. Christopher Browning in his book Ordinary Men noted how only a relatively few members of the SS murder squads operating in eastern Poland during the Second World War relished their work. The majority disliked it intensely and went along with the protracted routine of murder, even of children and infants, for reasons of unit loyalty and belief in the legitimacy of their orders. Only a very few, maybe 10% refused to participate in massacre. Pre-war politics was no predictor: German Social Democrats and Communists participated in slaughter along with Christian Democrats and Nazis. And some Nazis like Oscar Schindler and John Rabe were spectacularly heroic in their rescue efforts during the war. Christopher Browning makes the chilling observation in his book that anyone who wasn’t in the same situation who says they would not have participated in the killing had they been there is simply saying one thing: that they do not know what they are talking about. I think there is considerable truth in that assessment but I don’t agree with it entirely. Hugh Thompson Jr was an American helicopter pilot in Vietnam who intervened in the My Lai massacre because prior to ever seeing Vietnam and all through his time there he had engaged in mature reflection on what, literally, it meant to be a Christian soldier in such a war: what was acceptable and what was unacceptable. So when he saw fellow Americans involved in the butchery of unarmed civilians, much as SS troops and police had done 25 years before, he interposed is helicopter between them and the civilians and told the American troops bluntly that if they went any further he and his crew would personally kill them all. His moral courage enabled him to save the lives of 11 civilians. You don’t have to be a Christian like Hugh Thompson to demonstrate moral courage. And even if you are a Christian, or any religion or none, it is no guarantee that you will ever have it. What you do need is ownership of your beliefs and principles. Given the scarcity of moral courage even in the face of the most incontrovertible and horrific instances of human history this is clearly an uncommon phenomenon. And without deliberate consideration it is much less likely to be achieved in the face of, by those measures, the relatively trivial cases that so many of us more routinely face in the course of our lives as professional leaders. Lincoln showed his profound moral courage in the most dramatic terms in preserving the Union and abolishing slavery. Collins showed it in signing the Treaty, something he knew at the time was likely to be his “own death warrant”. It is this quality I believe more than anything else that is the most fundamental qualification for leadership: that stark moment of social isolation where you are prepared to raise your voice against the prevailing orthodoxy and vested interests to assert a different way irrespective of the personal cost. I remember in my first or second year at Queen’s studying civil engineering one of my lecturers, Harry Ferguson, giving a lecture on professional practice. One of the things that he said which had a perhaps surprisingly profound impact on me was “A professional will always sign his or her name to their reports”. It seems like a relatively mundane thing but it is a good indicator, though not a universal rule: if you are not prepared to put your name to something, if instead you seek the anonymity of a crowd – or a mob – you should first question your professionalism in the matter and then your moral courage in relation to your leadership. 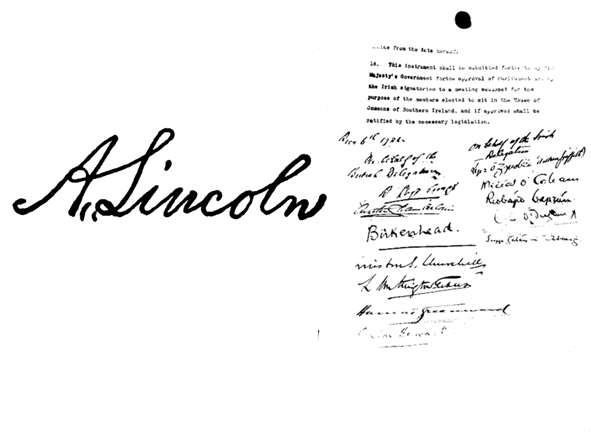 Lincoln putting his signature to the Emancipation Proclamation, Collins to the Treaty are among the starkest examples of moral courage and I am sure that each of you can think of additional examples from history, or personal or professional experience. The leadership challenges that we face are unlikely to cost most of us our lives. But how we respond to them is still an important measure of our conscience and soul. And the quality of life of others, and sometimes their very lives, depends upon them, sometimes more than we care to remember. Bear in mind that in this contemporary globalising economy with business’s perpetual search for cheap production and rare commodities we are often ensnared in unjust systems such as the ongoing atrocities of contemporary slavery. This makes us accomplices whether we want to be or not to things such as the enslavement of vulnerable workers in Thai fisheries, to make sure we have cheap prawns in our supermarkets, the enslavement of girls and young women in the garment factories of Southern India to provide cheap clothes for our high streets, and the child slavery used for the excavation of the minerals cobalt and coltan for our mobile phones. It is true that these practices by business, particularly international business, are enabled by the failure of governments to act to protect vulnerable workers across the world. But they can also be a very real expression of failure of leadership by individual human beings – business executives and politicians – who may pay lip service to ideals of leadership and the memory of people like Lincoln but fail utterly to emulate even a modicum of his moral courage. For that reason it is important for each of us to reflect on the sort of leader we want to be and the sort of moral courage and selfless principle we want to bring to the task. It is often a thankless and generally a painful process. But it matters: very often the first step on the path to transforming the world is transforming ourselves. Then if some of us, at some time, maybe even tomorrow, find ourselves in a situation where we have the power to reform and emancipate rather than simply acquiesce in injustice, we may find we have the courage to grasp that opportunity and change a moment of history for vulnerable people across the world. First of all, I’ve got to say what an overwhelming and totally unexpected privilege it is for me, a long time movie fan, to be here this evening to receive this award on behalf of Steve McQueen someone I regard as one of the greatest directors of his generation, for a movie that I believe will be regarded as an all-time masterpiece. With 12 Years A Slave Steve has stripped away all the comforting myths that are still sometimes peddled about US slavery and exposed that system for the archipelago of concentration camps that it was, maintained through violence and racism for the purpose of the dehumanisation and exploitation of other human beings. Today a minimum of 21 million people across the globe are subject to the violence of slavery: from the mines of Congo which enslave children to excavate coltan for our mobile phones, to the garment factories of South Asia which enslave girls and young women to produce clothes in such volumes for the global North that each of us here tonight is probably wearing a garment tainted by such slavery, to the World Cup building sites of Qatar, to the private homes of Europe where vulnerable migrant domestic workers often toil in servitude in the midst of our cities. Slavery is still with us, trapping and brutalising vulnerable people who have sought nothing but decent work. And that blunt fact indicts us all. Poverty will not be ended until slavery is ended, and yet the international community fails to recognise slavery eradication as a fundamental development goal. All our ideals of human rights are challenged by our failure to complete the first great human rights struggle, that to end slavery.